The cathedral of Florence is the main attraction of the city. Many tourists especially love the beautiful Tuscan marble cathedral facade. It is arranged in three different colours in geometric patterns. The facade of the cathedral itself is relatively new. It was built in the 19th century and was completed in 1887. The outer sides of the bell tower and the baptistery are made of marble in a similar style. However, they date from a completely different period. By far the oldest is the facade of the baptistery next to the cathedral. No red marble was used here, only the colours white and green. The bell tower (Campanile Florence) got its facade in the 14th century. All three colours were already used here. White marble from Carrara: The city of Carrara is located in the north of Tuscany not far from the Mediterranean Sea between Viareggio and La Spezia. It is the most famous marble in the world. Michelangelo also used Carrara marble for his statues. Green marble from Prato: Prato is a city just a few kilometres from Florence. Red (pink) marble from Siena: Siena is the famous city 100 km south of Florence, also in Tuscany. 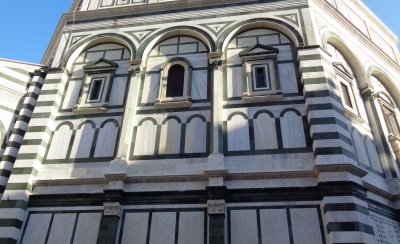 Short video: Outside with marble facade of the „Duomo di Firenze“. The modern video (360-degree technology) can be turned with the mouse. The cathedral of Florence had a completely different façade at the beginning. This façade was often criticized during the Renaissance and was finally removed around 1588 under the direction of Arnolfo di Cambio. 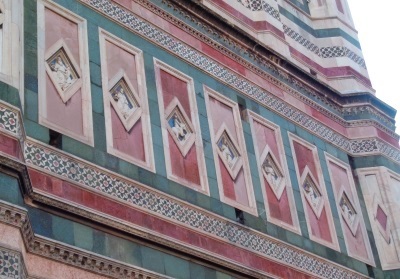 Many of the works of art of this old exterior cladding of the Florentine Cathedral have survived to this day. They can be found in the Cathedral Museum opposite the church. 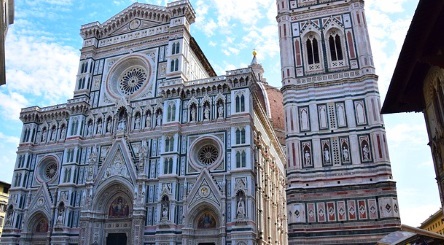 After that the Cattedrale di Santa Maria del Fiore Firenze (the complete Italian name of the cathedral) did not have a real façade for a long time. It was not until the 19th century that the cathedral was given its present three-coloured marble façade. The design is by Emilio De Fabris. Work began in 1871 and the façade was completed in 1887 after 16 years of construction.